김천 고방사 아미타여래설법도 1688년에 조성된 고방사의 후불화로서, 敏圓을 수화승으로 하여 竹䕺, 竟粲, 覺林 등 총 4명의 화승이 그렸다. 수화승 민원은 17세기 후반에 활약한 화승으로 알려져 있으나 현전하는 작품은 이 작품이 유일하여 작품의 가치를 한 층 높여준다. 보조화원 각림은 1656년에 조각승 무염과 더불어 완주 송광사 소조석가여래삼존좌상 및 오백나한상을 조성하였다. 정사각형에 가까운 화면에 아미타불과 8대보살, 용왕과 용녀, 10대제자 중 6제자, 사천왕, 팔부중 일부 등을 배치한 간단한 구성을 보여준다. 본존의 키형 광배를 비롯하여 높은 육계표현, 천공 바탕에 표현된 花紋, 채운의 끝부분에 흰색을 칠해 강조하는 기법, 불보살을 제외한 존상 얼굴에 바림을 이용한 음영법 등 17세기 후반 불화의 특징이 잘 드러나 있다. This painting depicting Amitabha Buddha giving a sermon was produced in 1688 by a group of four monk-painters led by Minwon, the other three being Jukchong, Gyeongchan and Gangnim, to be enshrined in Gobangsa Temple. Although the head painter is known to have been active during the late seventeenth century, this is the only painting of his remaining today. 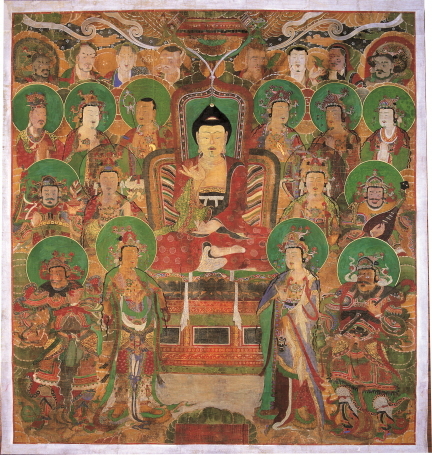 In the painting, the principal Buddha is attended by Eight Bodhisattvas, the Dragon King and Dragon Princess, six of the Ten Disciples of Shakyamuni, the Four Heavenly Kings, and some of the Eight Buddhist Guardians. The almond-shaped mandorla, lofty usnisa, the colorful clouds outlined with white, and the shading technique used to depict the face are some of the most characteristic features of Korean Buddhist painting of the late seventeenth century.